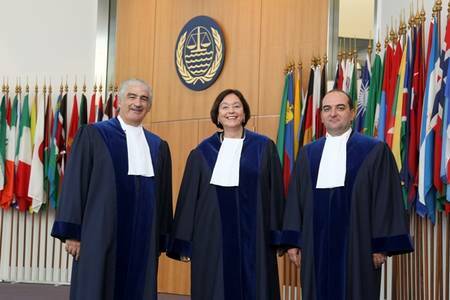 At the beginning of this month Elsa Kelly (center) of Argentina was sworn in as a judge of the International Tribunal for the Law of the Sea, based in Hamburg, Germany. A look at the roster of all who've served there since the founding in 1996 indicates that Kelly is the 1st woman ever to serve as an ITLOS judge. Kelly received a law degree in 1960 from the University of Buenos Aires, in the same city where she'd been born 21 years earlier; in the 1968 academic year she did postgraduate studies in jurisprudence at the same university, where subsequently she became a Professor Public International Law. In 1977-1978 she studied as a Fellow at Harvard's Center for International Affairs. In the course of her service in the Legal Advisor's Office of Argentina's Ministry for Foreign Affairs, Kelly was the Deputy Head of the Argentinian delegation to the Third U.N. Conference on the Law of the Sea -- after which she served for a year as the Ministry's Legal Advisor. Among her many other government and international law positions: 1st woman to serve as Secretary for Foreign Relations; Argentine Ambassador to Italy; 1st Vice President of the Inter-American Commission of Human Rights; and Argentine Ambassador to Austria and Permanent Representative of Argentina to the U.N. Office in Vienna, a post that included membership on the Board of Government of the International Atomic Energy Agency.